When you look at or wear various silk products which are so elegant, poised and possessing natural grace, you must wonder how silk - the "queen of fibers" - comes into being. The Latin name for the silkworm is BOMBYX MORI. It belongs to the order Insecta, genus Lepidoptera. 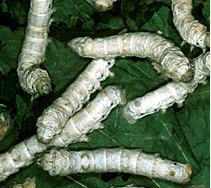 Silkworms reproduce from eggs. It takes 1,500 silkworm eggs to make one gram (40,000 eggs per ounce)! The fertilized eggs will hatch into a larva. The body of the newborn larva is black or very dark brown with stiff little hairs. It looks like a little ant and in Chinese it is also called an "ant silkworm". As they grow up, silkworms eat continuously. They grow new skins and shed the old ones. This is called molting. The period between two sloughs is called an instar. Silkworms shed their skin five times while growing up. The silkworm eats continuously for twenty-six days. Then it stops eating and spins its cocoon. The thread from a single cocoon is about one-and-a-half kilometers (one mile) long! After the silkworm spins its cocoon, it sheds its skin one last time and becomes a pupa. The pupa is elliptical in shape . The female's abdomen is large and has a rounded end. The male's abdomen is smaller and has a pointier end. The adult of the silkworm is called the silkworm moth. The pupa shell splits open and the silkworm moth emerges from it. It secretes a special saliva which dissolves a hole in the cocoon, so the moth can push its way through the silk and emerge into the outside world. The moths cannot fly since their bodies are large and their wings are small. The silkworm moth mates with another moth within minutes of emerging from the cocoon. During mating, which lasts one day, the moths consume a lot of body energy. The female lays eggs immediately afterward. The moths do not eat, and die naturally after one week. To make silk, the cocoons are heated to kill the pupas and dry the cocoons. The factory unreels the silk from the cocoons, thereby producing raw silk (white thread). Zhejiang province of China is the main source of Chinese silk. There are more than three hundred silk mills in the province. It is China's largest producer of silk and silk piece goods. ManYee DeSandies, a teacher of a third-grade class at Alvarado Elementary school in Union City, California has taken many wonderful pictures of silkworms growing in her classroom. Wormspit has a wonderful collection of photos of the entire silkworm cycle and tips for rearing them at home.